Disney is one of my favorite companies on the planet. I’ve been to Disneyland and Disney World more than 75 times. And, Disney is one of the ultimate customer service role models, which is why whenever I hear about a new book or an article about Disney, I read it. 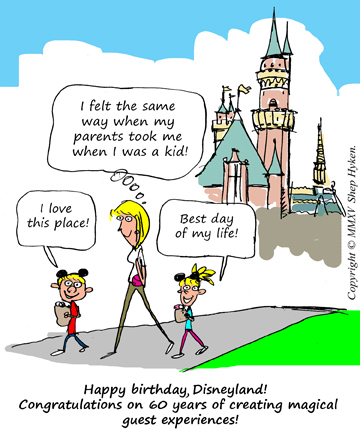 Many lessons can be learned by understanding how Walt Disney approached leadership, culture and the guest experience. I recently read an article by Peter Economy in Inc. Magazine. In honor of Disneyland’s 60th anniversary, he compiled 37 inspiring quotes from Walt Disney and some of his movie characters. I chose a few of my favorites and tied them to customer service lessons we can all use. If you can dream it you can do it. –Walt Disney – One of the most famous Disney quotes, and great advice for anyone getting into business – and anyone who is trying to solve a customer’s problem. Sometimes it takes creativity to make a customer happy. Venture outside your comfort zone. The rewards are worth it. –Rapunzel (Tangled) – The best companies empower their employees to make good customer-focused decisions. Unfortunately, there are many that are afraid to do so, mostly because they are worried that their employees might make bad decisions. For those companies, it’s time to venture out of your comfort zone and empower your employees. Start by training employees to make good decisions, and if they make a bad judgement call, use it as a training opportunity. With the right training and management, you’ll be surprised how quickly you’ll create the empowered workforce – and feel comfortable about what used to make you feel uncomfortable. Oh yes, the past can hurt. But the way I see it, you can either run from it or learn from it. –Rafiki (The Lion King) – This is a perfect follow-up quote to the last one. No doubt our employees will make mistakes. And some of them, while painful, will be learning opportunities in disguise. Embrace the past to help you and your employees grow in the future. A little consideration, a little thought for others, makes all the difference. –Eeyore (Winnie the Pooh) – Put yourself in your customer’s shoes. Show empathy, sympathy and consideration. It goes a long way to building a relationship with your customer. The problem is not the problem. The problem is your attitude about the problem. –Jack Sparrow (Pirates of the Caribbean) – Attitude is everything. At work, and in life, we’re faced with problems every day. And, it’s the same for our customers. Our attitudes about our customers’ problems can turn angry customers into loyal evangelists. Just because it’s what’s done, doesn’t mean it’s what should be done. –Cinderella (Cinderella) – Perhaps this is one of the earliest quotes about innovative thinking, and it came from Cinderella! You don’t always have to do things just because they’ve always been done that way. Once again I’m using that word, “empowerment.” If you empower employees to come up with creative solutions to problems, you’ll be amazed at the results. Always let your conscience be your guide. –The Blue Fairy, although many think it was Jiminy Cricket (Pinocchio) – Okay, this really isn’t about customer service, but it is one of my favorite Disney quotes. It’s a rule to live by, and the message is simple: Do the right thing.